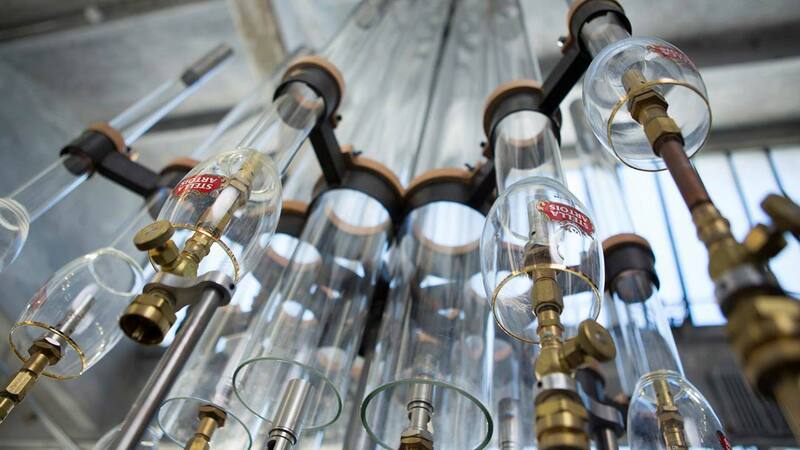 If great symphony’s are both a labour of time and love and a musical journey, then Stella Artois have been true to the form with The Stella Artois Chalice Symphony. The year-long project by the world’s number one Belgium beer has taken a sophisticated and unique approach to branded entertainment. 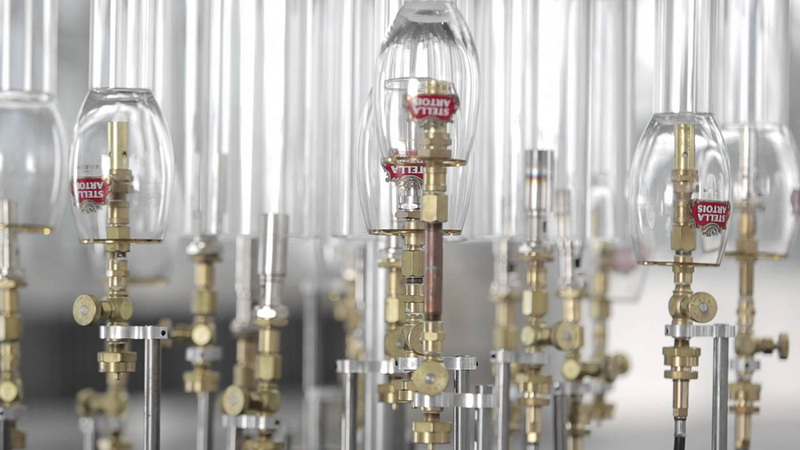 The Stella Artois Chalice Symphony ft. Andy Cavatorta from Dustin Cohen on Vimeo. 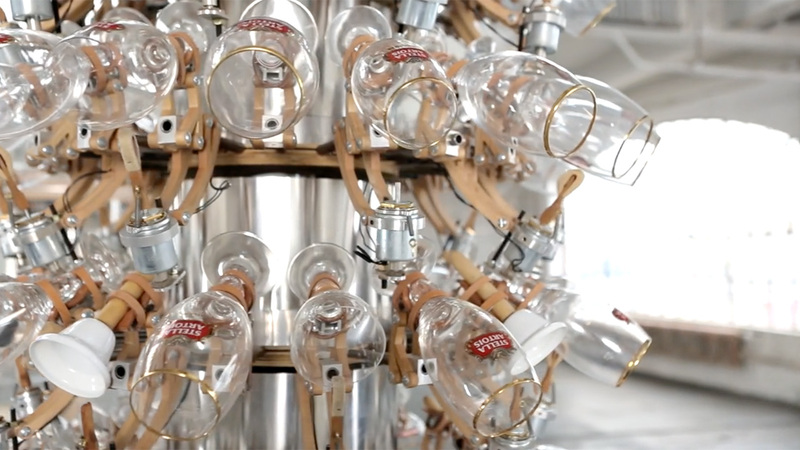 Stella Artois, and its agency Mother, collaborated with sound artist or ‘musical craftsman’ Andy Cavatorta to create four musical instruments made out of the beer’s iconic ‘chalice’ beer glass. The result was four beautiful creations, all created using branded Stella Artois beer glasses, or chalices. The Hive takes its name from the instrument’s unique shape and sound, resembling a soft xylophone; The Pyrophone adds depth to the symphony with a deep whistling sound, like a boat horn; The Star Harp uses robotics to play a harp-like sound using strings and the Stella Artois Chalice – “Stella” means “star” in Latin; and The Violina leverages a higher-pitched string sound, resembling a violin for the symphony. 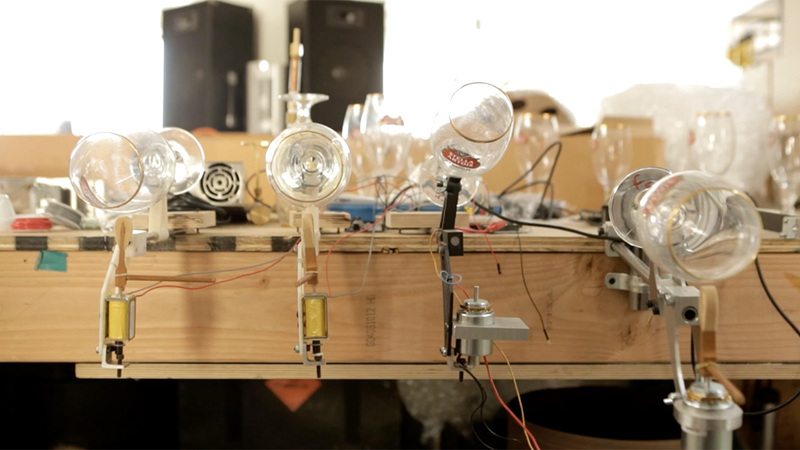 Cavatorta, an MIT sonic inventor whose past projects include the Gravity Harp for Bjork’s Biophilia album, then worked with indie rock band Cold War Kids to use the instruments to write and produce a song, ‘A Million Eyes’ which is available to fans to download. Stella Artois captured all of this and is releasing films online to showcase the journey. The Stella Artois Chalice Symphony launched online last month with a dedicated website featuring images and descriptions of all four instruments and has been releasing new films detailing the idea, showcasing the instruments, and the collaboration with Cold War Kids. “This year-long journey has been the ultimate exercise in craftsmanship. We’ve made four instruments, composed a song that brings them to life, and filmed a music video to share that song with the world,” said Stella Artois. “With Chalice Symphony, we also saw the opportunity to do something that has never been done before and reach an entirely new group of consumers, specifically lovers of music. Not only are the instruments feats of engineering and design, but the sounds they create are universal to any genre of music,” said Koyama. The Stella Artois Chalice Symohony is unexpected and really quite lovely. This is a beautiful way to demonstrate how branded arts can create an authentic and legitimate art that people want to engage with. While the idea of collaborating with musicians has been done many times before, its never been done quite like this. The idea of crafting and creating unique bespoke instruments, made from one of the product’s most iconic and premium elements, again may have been done before, but these instruments are works of art. 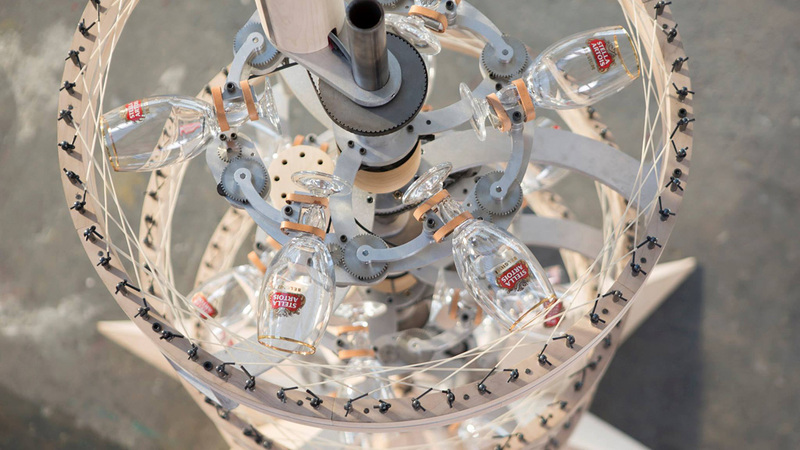 Stella Artois and Cavatorta have created some beautiful instruments, which also double as a a lovely interactive exhibition which is available for a limited time at a gallery on Manhattan’s Lower East Side. It would be great to see this exhibition on tour to other markets – depending how well those instruments travel. I am particularly fascinated by Cavatorta and his story, his background as a musical craftsman is intriguing, and the experience of creating the instruments is a great one. The ‘Making Of’ film only whets the appetite. The collaboration with Cold War Kids, which has created a great track – I recommend downloading it – is a really savvy way of opening the brand to a new audience. Crucially this element needed to be authentic and Stella has managed it, there’s nothing forced here, you see musicians who are genuinely excited to work with these strange new instruments and the song they create is good. While Stella’s aim was to introduce new audiences to the brand – clearly young music lovers – this project has such universal appeal it’s guaranteed to change the way many people see the brand. But what I think is especially significant is the way this brand speaks to Stella’s established audience through the experience of the brand and its iconic glass or chalice. This project takes the individuals experience of the brand – which is all about the drinking, and therefore all about the glass – and brings it to life in a truly unexpected manner. There is a craft and a style that goes with drinking Belgian beers – it’s something of a ceremony: there’s the pour, the knife to cut the foam and the chalice. This is the ritual of Belgian beer and while Stella is more often served in normal pubs without that sense of ceremony, it’s usually still served in the Chalice. What better way to leverage the Belgian beer’s heritage than through the glass, which plays on the experience of drinking a Belgian beer. It comes at an interesting time for beer, which is under fire from a number of alcohol rivals. The explosion of cider, the ever-expanding love affair with wine, and the hipster-driven fascination with microbreweries and new craft beers means the big beer guys are on the ropes. In this environment beer brands are moving quickly to carve out a niche and a strong identity to ensure they remain relevant to drinkers and can attract new audiences. There are not too many beer brands that could legitimately create a project like this, it manages to perfectly balance being arty and classy with being really quite cool. This has the potential for widespread appeal, so it had to be a premium beer with global appeal, it probably could only have been Stella Artois. Stella has traditionally played on heritage and tradition with its advertising and branding. It has leant heavily on the past and as such it has probably been viewed as old and maybe irrelevant to younger drinkers. This campaign plays on the heritage and tradition of the beer but brings it to life in a new and modern way – helped exponentially by incorporating with a hot new indie band. It will help to reposition the brand in markets where it has become less relevant especially in the UK, where it is not seen as a premium beer. For the Stella Artois brand, this is about creating relevance to audiences but also about doing something interesting and creative to cut through the noise of other beer brands. For me, the strategy seems to revolve around three pillars: craft, heritage and premium, and the celebration and demonstration of these three elements underpins the entire project. The creation of the instruments is a nod to the craft of creating a great beer and the art of the chalice, a glass specially designed to enhance the taste of the beer. 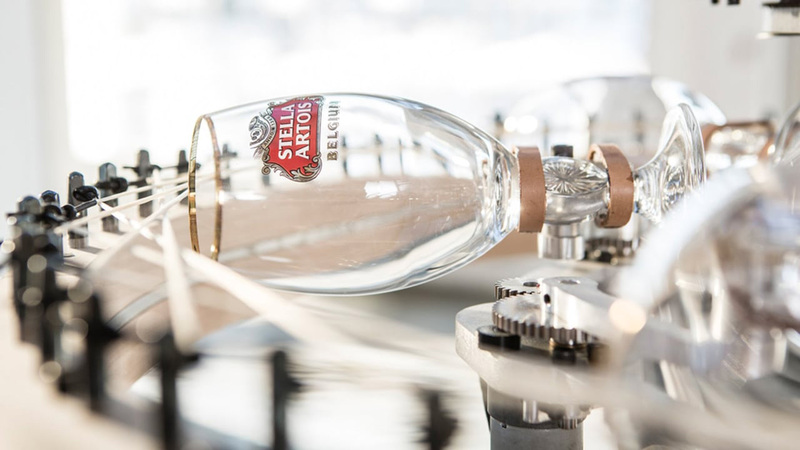 The act of using this ‘special glass’ to create, suggests Stella Artois is not just creating great art and music, but it nods to the idea that the beer and the glass create great music together. Everything about the Stella Artois Chalice Symphony is premium – particularly the name, yet it positions premium as special and unique rather than pricey and high brow – this is a great achievement and one that will be successful for the brand. There are clear comparisons to be made with the work Intel Australia did with artist Flume, as well as Ford and Ok/Go, and a number of other collaborations, however I’m not sure any of that matters. While all these collaborations used the products as instruments and engaged musicians to create songs, this is where the similarities end. The Stella Artois Chalice Symphony is a beautiful, elegant exploration of the sound and beauty that its special beer glass can create. This is about creating art, first and foremost and for that Stella Artois should be commended. Stella Artois has created a beautiful branded arts campaign, which brings the brand to life in a really cool and unique way. A wonderful achievement.